The winners of the gender equal entrepreneurial and innovation competition DreamBig 2018 has been awarded. Over 160 business ideas competed for 3 million SEK in venture capital and an accelerator program to kickstart the winning contributions. 40% of the contributions consisted of female entrepreneurs, which is unusually high. Now the jury has appointed four winners; Swapster, Nanvio, YouGo and Detecht. Everyone will get a seat in DreamBig's accelerator program worth 3 million SEK. In fierce competition, the jury has appointed four winners. Everyone of them has presented a business idea that combines entrepreneurship, drive and passion. The jury's assessment is that the four winners have great business potential with the opportunity to make a difference. – When we started DreamBig, it was to wake up dreams, inspire to deeds and to be very clear that it applies to everyone regardless of gender. Therefore, we decided to equate the venture capital itself. It gave a result where 40% of the contributions had completely female teams, which is unique in our industry. Now we are proud to introduce four teams with business ideas that we truly believe in and will follow, and boost all the way to success, says Lars Kry, CEO at Sigma IT Consulting. "With genuine entrepreneurship and great passion, the winner wants to create a new move for smart and flexible trade and thus contribute to a sustainable society and a better tomorrow." "With strong conviction, willingness and expertise, this team has worked out promising products for the purification of harmful particles in both air and water. The business idea is based on unique research in nanotechnology with the potential to change the world. "With a clear ambition to make Sweden healthier, the team has found an important niche in the borderland between supporting individuals for a healthier life and giving companies tools to consciously support resources for proper health initiatives." "A groundbreaking opportunity to increase the safety of an exposed group in traffic. A service that is easy to use but is built on advanced technology and has huge potential for further development. Behind is a strong and inspiring team that has attached good advisors and partners. 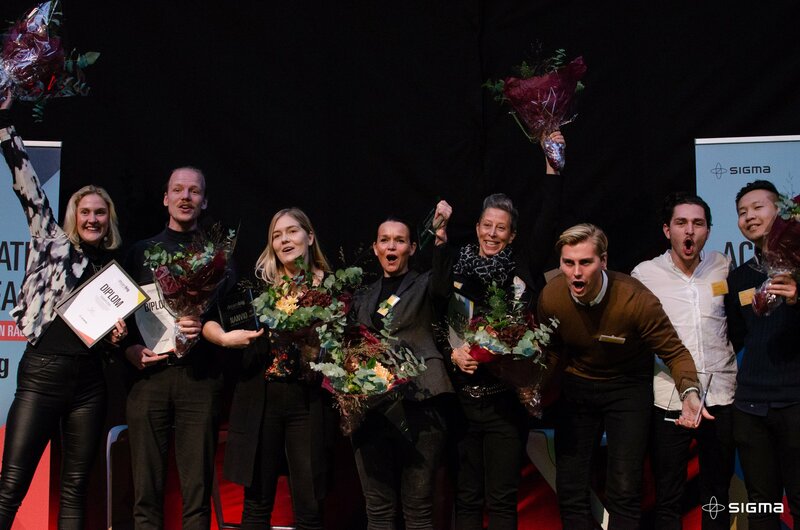 The winners were presented on Sigma's Inspiration Day at Eriksbergshallen in Gothenburg on November 30th. All winners are given a seat in Sigma DreamBig's accelerator program worth 3 million SEK and individual jury members have the opportunity to step into the business ideas as investors. Lena Apler, CEO and founder of Collector, Louise Samet, Angel Investor and former manager of investment operations at Norrsken, Karin Ebbinghaus, Investment Manager at Almi Invest GreenTech, Johan Magnusson, Associate Professor at Applied IT, University of Gothenburg, Lars Kry, CEO at Sigma IT Consulting and Johan Kjörk, responsible for the innovation process at Sigma IT Consulting.